If you run a business in the food sector, a food safety program is essential in keeping your business safe for your employees and your consumers. If you don’t know where to start, this it the perfect post for you! This post will be dedicated in providing step-by-step methods you could follow and it will be based on the Hazard analysis and critical control points (HACCP) system. Risk: a combination of the likelihood of a hazard occurring and takes the severity of consequence of the consumer into account. Meet all the food safety requirements set out in the Food Standards Code, specifically in Chapter 3. Important things in thisstep is to ensure that your ingredients come from safe sources and if necessary, be ready to get documentation from the suppliers to prove that the ingredients were prepared in safe conditions. Keep a good records! This will help you track where raw materials come from, what condition they arrived in and which product batches they were included in. Comply with step 1 first! One you start doing that, it will help you see in what parts there might be flaws in your system. In order to develop a HACCP plan, you need to assess the hazards in your business and consider how you are going to control that hazard. That is the most important part in figuring out the safety of your product. 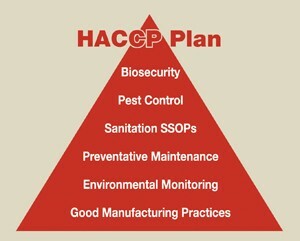 We suggest the HACCP plan because it is effective. It is very methodical but in some cases, it just doesn’t match with the hazard your business might be facing. In that case, if you can prove that you have put a place control in measure and can demonstrate that has the hazard under control, that is also acceptable. In some states in Australia, like Victoria, have allowed the use of templates in this structure. But check with your local government before applying a template to your business. Food services that supply food to a sensitive population eg. nursing homes, school canteens etc. processed raw foods which are not given pasteurisation treatment eg. sausages, fresh cut vegetables that are to be eaten raw and raw milk cheese. Food is the main concern for a food safety program but there should be other things an employer should consider as they write their program. A very important part of these programs is to protect not only your consumers but to also keep your employees safe from harm. In the food industry, there are two main aspects of workload that needs to be considered – lifting and proper use of a knife. Identify what you are lifting and make a plan! Consult a food safety expert – they are always available!